I am afraid of South African trains. I admit it. I have always been frightened of taking the train in South Africa. Judge me if you like. Call me ignorant, call me a typical negative privileged South African, but up until recently, the thought of commuting to and from work by train would have been unthinkable. From as early as I can remember, I have always been told that the trains are terrible. Scary. Dangerous. And this wasn’t unfounded – even if certain fears were probably over emphasised. For years the crime on trains, and getting to and from stations, has been a genuine cause for concern. However, since 2006, Metrorail has made a couple of decisions that have made a difference. Like the introduction of the railway police and in Cape Town, the complete overhaul of the railway station. ( It has all the familiar trimmings and trappings of any international station). And according to an article with Prasa in the Financial Mail, they have seen reduced crime figures year on year. But, just the other day – on Monday the 7th July in fact – a Zimbabwean man, Reason Wandi, told the media that he was thrown from a Cape Town train in what is thought to be a xenophobic attack. This very bad news seems completely overshadowed by the hordes of triumphant train trumpeters – a category which I have also fallen into with abandon! Hundreds of foreign tourists and locals have been having a party on the World Cup train routes. They can’t stop singing the praises of the train. I chose to commute to and from Cape Town rather than risk getting into a car accident while commuting for 2-3 hours a day on crowded highways populated by impatient hooligans driving up your bum. The decision was further prompted by experiences of travelling in India. Seeing that billions of Indians commute by train and millions of South Africans commute by train – chances are most of them just want to get to work. The odds of meeting a mugger/attacker/thief are not really that high. Especially during rush hour . While the chances are certainly higher on deserted trains and at empty train stations, the alternative isn’t too peachy either. Muggings or car accidents? Which one will it be? Nonetheless, I made the decision to “train” and was pleasantly surprised. I have been loving it – as much as you can love a commute. What us car owning folk tend to forget, is that traffic jams are a luxury. Having the funds available to afford your own personal transportation device is a privilege. And while the choice of reading material of my fellow travellers left much to be desired ( Medical Romances, Afrikaans large print romance, You, Drum and the autobiography of Steve Hofmeyer.) It’s been lekker. Especially being able to close my eyes for 40 winks along the way. But, it would be naive, and possibly very dangerous, to ignore the ugly bits of train travelling in SA. There may be a sense of euphoria in the wake of the World Cup, but it is unfortunately not going to erase the hard issues we face. That said. Take the train. It’s fun. Just keep your wits about you. According to legend, Pushkar, which is located in the desert of Rajasthan, came into being when Lord Brahma, the Creator, dropped a lotus flower from the heavens in order to kill a demon. Magically, where the petals landed, three lakes appeared and Lord Brahma is said to have organised a gathering of 900,000 celestial beings on the banks of the lake. 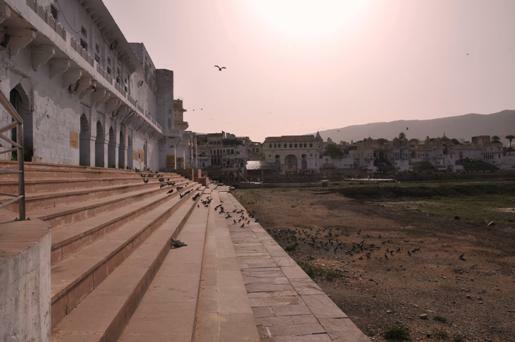 Today Pushkar Lake is considered one of India’s most sacred sites and is surrounded by hundreds of temples and bathing ghats. Each year in October and November, hundreds of thousands of pilgrims make their way to the waters in the belief that during this period the water will cleanse them of all impurities. This celebration coincides with the largest camel market in the world when more than 150,000 dealers and tourists come to the tiny city. (Thanks to Rough Guide for the facts). Unfortunately, while I was there, the lake was virtually empty. Rajasthan has been severely affected by drought over the last few decades – with more than 32 million people suffering as a result. The state has to pipe in most of its water from other areas of India and holds only 1% of its own water. Speaking to a local restaurant owner, in the previous year there had been only 15 minutes of light rain – otherwise, not a drop has fallen. The Thar Desert is the most densely populated desert in the world, and the drought combined with a number of badly managed water projects such as canals and dams, has meant that many lakes have dried up, or are drying up. In addition, with the implementation of piped water to most towns, many of the age old frugal water usage traditions have been lost as people have come to rely on the government being able to provide water at all times. Yet in spite of this, pilgrims still make their way to Pushkar and perform puja (prayers) at the many bathing ghats that surround the now dry lake. The scene is peaceful and powerful – bathers gather in the water while cows wander the steps and holy men provide flower petals and blessings to visitors. Beware though – the Brahmin (priests) can be quite forceful in getting you to take part in Puja ( a repetition of prayers at the water’s edge including the throwing of petals, rice and the tying of a red cord around your wrist, followed by a donation). On my first visit to the ghat, a very proactive Brahmin took me through the prayers and blessing only to virtually demand that I donate a huge sum of money. For me, it made the experience quite unpleasant – while I understand that they have to raise money, it felt insincere and I couldn’t help feeling like I’d been suckered. Wherever you are in India, generally if any mystical looking person tries to tie a blessed cord around your wrist and dot your forehead with red or yellow, know that you are going to be expected to cough up funds. Thankfully, once you’ve done your bit, you’re unlikely to be hassled by other Brahmins later on as they’ll be able to see your “Pushkar Passport” (your red thread). Nonetheless, after that whole palaver, walking around the ghats, even without the holy lake glimmering in the afternoon sun, was inspiring and very relaxing in the warm dry air. The 500 temples that surround the lake are connected to the water by 52 ghats – said to represent each of Rajasthan’s maharajis. These rich old men would build their own guesthouses and hire priests to do their religious business on their behalf. Interesting facts include the fact that Mahatma Gandhi and Jawaharlal Nehru’s ashes were sprinkled into the lake from the main ghat. In addition, Brahma ghat is supposed to have been Brahma’s very own worship spot. 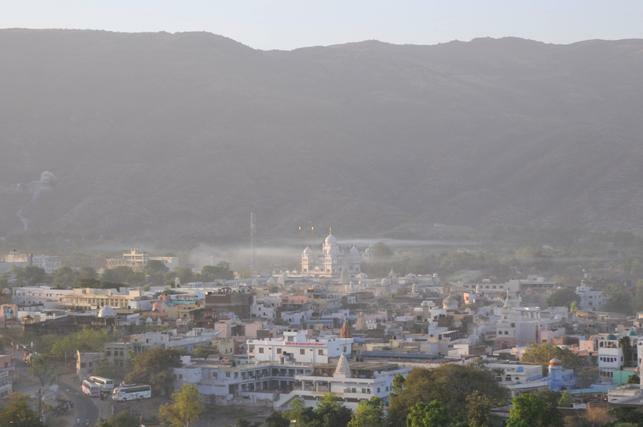 With over 500 different temples in Pushkar, if it’s your thing, you could spend days visiting all of them. I quite enjoyed walking up a nearby hill to the Gayitri temple which was built for Brahma’s wife. The story goes that Brahma was going to marry Savitri, but she was late for the ceremony and Brahma had to quickly find someone else to marry at the gathering of the deities, yagya. The only eligible woman was Gaytri, from the untouchable Gujar caste. In order to purify her, they passed her through the mouth of a cow (gaya means cow, tri means through). In any case, Savitri flew off in a huff to the temple that now stands on the high hill across the way from Gaytri’s temple, while the main Brahma temple sits near the water’s edge. The walk up to Gaytri Temple take about 20 minutes, while that up to Savitri apparently takes around an hour and a half. Pushkar, being a holy city, is entirely vegetarian. No eggs, meat or alcohol are allowed in Pushkar and drugs are frowned upon. However, that doesn’t stop the pleasure seekers and tourists from enjoying whatever their poison may be. As a vegetarian, this meant that every restaurant we went to had many delicious options and we found ourselves visiting an assortment of eateries and rooftop restaurants. The destination is popular with tourists and you could see quite a number of young travellers looking as though they had consumed far too many bhang lassis (like a marijuana milkshake). Beautiful, thin women with dirty dreadlocks and bloodshot eyes sat in corner cafes with their bearded and dusty partners. I found it difficult to imagine coming to India simply to smoke as much dope as possible and float around in a stoned haze. From speaking to a number of locals, it seems that Israelis in particular have a very bad reputation and are not well liked. They tend to travel in large groups, living cheaply and spacing out on drugs. It is one of the popular countries for Israelis who have just finished their national service in Israel and India is their country of choice for getting lost. I found it quite amusing that many of them had fake dreadlock extensions added to their hair. In any case, I am not quite sure what it is that they do that so irritates the Indians, as there are many other travellers who are also intent on losing themselves through hallucinatory experiences, but they haven’t done much to inspire respect. In any case, back to the eating. We had a few hits and one terrible miss. The Satyan served a vegetarian Thali ( kind of like a mezze platter with a few different dishes) that tasted burnt, old and reheated. My mother’s paneer (cottage cheese) dish was inedible and tasted awful. While this was the only bad experience, guide books do say that this is common in Pushkar with the myriad rooftop restaurants in the town. On our last day however, we discovered Dreamland Roof Top restaurant run by Ashok Mittal. The woman in charge made the most delectable dishes, and after speaking to her for a while, she told us that she would never hire a chef because, “ I know if I make good food, people will come back.” Yum – vegetarian’s paradise made even better by the beautiful views. And, while alcohol is officially outlawed, if you really feel like a drink, most restaurants can get you a beer. As we were in Pushkar during off season, accommodation was cheap and the main bazaar area, which has silver jewellery, clothes, fabric and curio shops as well as food stalls, was not overcrowded. There were amazing clothes and stunning silver jewellery. If I had a larger suitcase, I would have gone shopping crazy. We also had some comfortable cotton slacks made up by one of the local tailors for next to nothing. On that note, the tailor culture in all the places I visited was something I really enjoyed. In Pushkar, every second shop has a small old foot powered Singer sewing machine and every item in the shop can be made up for you, “No problem” in a couple of hours. Later, in Manali in the mountains where warm fleecy jackets are very popular, you can also choose your fabric and style to be made to fit. The speed at which items are completed is remarkable, especially considering that most of the sewing machines are foot powered. After 20 hours on the train, we finally arrived at Ajmer station. To get to Pushkar, you have to take either a taxi or a local bus. On leaving the station, we were immediately hounded by taxi drivers trying to get us to drive direct with them and rickshaw drivers asking for exorbitant amounts of money to take us to the bus station 2 km away. It was quite frenetic, and I felt more eyes staring at us than I had in Mumbai. Our first port of call was to buy our ongoing train ticket to Delhi on the much fancier Shatabdi Express. One nice thing about travelling by train in India is that at all reservation offices there is a special line for foreigners, senior citizens, disabled persons etc. This means that you can skip most of the long queues and is definitely one perk to being foreign. Also, in order to make travel easier for foreigners, the train companies reserve a certain percentage of tickets for tourists, meaning that you can generally book your ticket on the day or the day before for even the most popular train routes. The tickets bought (about Rs 600 for one adult, Rs 300 with senior citizen discount of 50%), we headed outside into the thick of the taxi drivers. Disorientated by the yelling from all directions, it’s easy to be rushed into choosing a taxi to escape the madness as soon as possible. But its far cheaper and takes just as much time to take a rickshaw to the bus stand and catch the local bus to Pushkar ( The taxi was overpriced, Rs 50 for 2km, but the bus is only Rs10 per person and leaves every 10 minutes). Once on the bus, it’s a leisurely ride through Ajmer, where you drive past a beautiful lake and crawl up over a winding mountain road to the town of Pushkar itself.